A central location for character sheets. Weapon Finesse: Use dex instead of str for attack/damage bonus. Dirty Fighter: Benefit: When you hit a foe you are flanking, you deal 1 additional point of damage (this damage is added to your base damage, and is multiplied on a critical hit). This additional damage is a trait bonus. Reactionary: Benefit: You gain a +2 trait bonus on initiative checks. Sandy is a human male about 15 summers old. He is slender; lean rather than waifish. He has loose blonde curls and dark blue eyes. He is trying to grow a goatee and is quite proud of the scraggle of fuzz on his chin. Sandy is curious to a fault. It’s typical for children whose mothers die in childbirth to be named after the saint whose day they were born on. Sandy’s father considered himself completely ill-equipped to deal with the infant on his own. He figured the best thing to do was invoke all saints every time the boy’s name was mentioned. Thus, All-Saints Tippenroe— eventually called Sandy— came to Kessan. Being an apprentice illuminator has afforded Sandy the opportunity to meet and mingle with some of the most educated men in Kessan and the surrounding communities. He occasionally acts as an agent for merchants, ranging up and down the river to settlements, lumber camps, and even as far as the city. He has gained a reputation for being diligent, honest, and cheerful— though not exactly punctual. Sandy smirks. Jimes smiles. They stare at one another, smirking and smiling and being very, very still. That gives Sandy pause. And his pause makes the corners of Jimes’s mouth twitch. Which lets Sandy know he’s caught. Blessings (3/day) (Su) Pool of power used to activate Blessing abilities. Combat Reflexes (3 AoO/round) Can make extra attacks of opportunity/rd, and even when flat-footed. Sacred Weapon (Su) As a swift action, grant weapon enhancement bonus or certain powers. Endurance +4 to a variety of fort saves, skill and ability checks. Sleep in L/M armor with no fatigue. Low-Light Vision See twice as far as a human in dim light, distinguishing color and detail. Scent (Ex) Detect opponents within 15+ ft. by sense of smell. Maura Zita dared not waste the opportunity to learn with the temple of Iomedae even though it meant leaving the familiar family farm just outside Kassen. Though forbidden from leaving by her parents, Maura slipped away from her old life without a thought. To a girl of sixteen, riding the great lifts into the city of Skelt symbolized a transition to a whole new world of existence. Overwhelmed at first by the busy city, Maura soon fell into rhythm with the guidance of her peers and teachers. Though letters Maura sent home to her parents remained unanswered, she was able to maintain correspondence with her younger brother. After a few years, those letters stopped as well. Her life at Kassen faded to what seemed to have been just a dream. A letter from an old friend of her parents shook Maura awake: her father and brother had died in a fire on the farm and her mother was seriously injured. Her mother was planning to join the journey to the Everflame to honor their passing, but her own injuries would make the journey more perilous than it should have been. The friend begged Maura to return home and take the journey instead. Maura received permission to travel home for the ceremony, and, by the next day, she descended the lifts into her past. Kirdo Dunritty, Gnomish alchemist, brewer, glassmaker, traveling salesgnome. There were plenty of dangers and annoyances facing a gnome salesman in a largely human world, but thankfully the Silvers were good people. Trelvar was, after confirming with his own senses that Kirdo's wares were good, was pleased to add a little something nicer than the usual beer and ale, and a touch of the exotic with which to entice his customers. Asina, for her part, was fascinated by the gnome, almost riveted by the idea that someone shorter than her was older than her father. Kassen was a small town, after all. She plied him with questions about his travels, which he answered in not-quite-grouchy ways, having other things on his mind but better sense than to alienate the Silvers. Besides, she didn't mean any harm by it. "So, with just a few alterations to your brew, I think your customers will be pleased, Trelvar," he said to the human innkeeper, totting up his fee in his head. Kirdo had been careful not to offer such advice until asked, his credentials so to speak established. He would never compete in volume with Trelvar, but he could chip in here and there. Trelvar was a client after all, and word of mouth was the best advertising. "And when I return from this Everflame ritual, we can settle up on those kegs I brought with me." He looked forward to it. Kassen was a nice town with friendly people, just the sort of regular income he wished to establish for himself, largely to fund more exciting projects. "Aye, we'll see what comes of it," Trelvar replied cagily. Neither of them had much doubt Kirdo's ale would sell quickly-it had in the past-but this was business, after all. "What brought an outsider gnome to think of joining up to return the flame, anyway?" he asked, though the savvy human felt he knew. "I've never been to the area," Kirdo replied truthfully. "In my line of work-my other line of work, that is," he touched his belt where glass vials of his own make hung, ready for throwing or ingestion, "you never know what a new place will turn up useful for alchemy. And besides," he went on with a smile that was almost unsettling in its enthusiasm, given that he was a gnome, "folk will love to buy the best from a gnome who returned the flame," he said as he headed out the door. He smiled a bit to himself as Trelvar began to holler for his daughter, who had made herself scarce while the two dithered. Adaptability (Ex) Half-elves receive Skill Focus as a bonus feat at 1st level. Elf Blood (Ex) Half-elves count as both elves and humans for any effect related to race. Elven Immunities (Ex) Half-elves are immune to magic sleep effects and get a +2 racial saving throw bonus against enchantment spells and effects. Keen Senses (Ex) Half-elves receive a +2 bonus on Perception skill checks. Low-Light Vision (Ex) You can see x2 as far as humans in low illumination. Characters with low-light vision have eyes that are so sensitive to light that they can see twice as far as normal in dim light. Low-Light Vision is color vision. A spellcaster with low-light vision can read a scroll as long as even the tiniest candle flame is next to her as a source of light. Characters with low-light vision can see outdoors on a moonlit night as well as they can during the day. 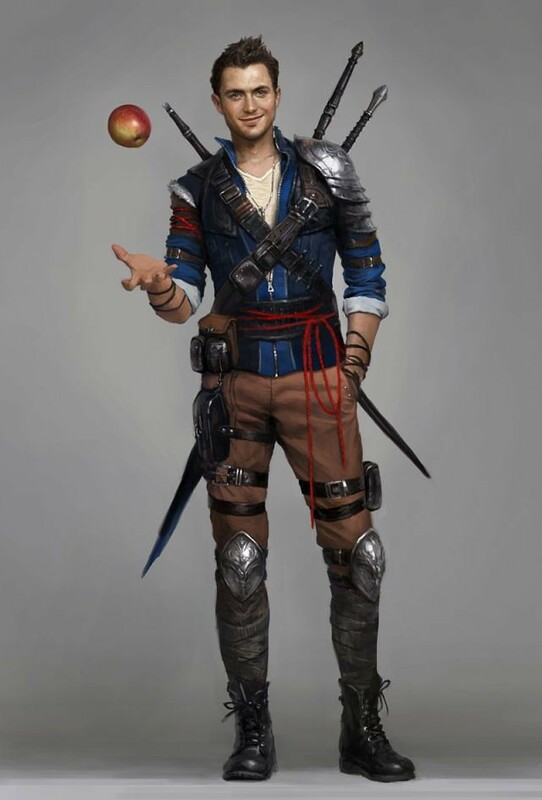 Multitalented (Ex) Half-elves choose two favored classes at first level and gain +1 hit point or +1 skill point whenever they take a level in either one of those classes. Track (Ex) You gain +1 to Survival checks made to follow tracks. Favored Enemy, Vermin (Ex) You gain a +2 bonus on Bluff, Knowledge, Perception, Sense Motive, and Survival checks when using these skills against vermin. Likewise, you get a +2 bonus on weapon attack and damage rolls against such creatures. You may make Knowledge Skill checks untrained to identify such creatures. Wild Empathy (Ex) You can improve the attitude of an animal. This ability functions just like Diplomacy check made to improve the attitude of a person. You roll 1d20+2 to determine the Wild Empathy check result. The typical domestic animal has a starting attitude of indifferent, while wild animals are usually unfriendly. To use Wild Empathy, you and the animal must be within 30 feet of one another under normal circumstances. Generally, influencing an animal in this way takes 1 minute, but as with influencing people, it might take more or less time. You can use this ability to influence a magical beast with an Intelligence score of 1 or 2, but you take a -4 penalty on the check.